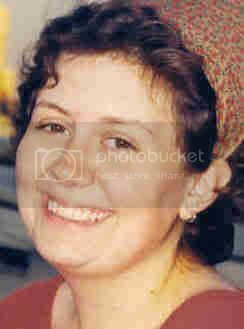 It got me to thinking about one of my good friends from college - a sweetie by the name of Loretta from Beaufort, SC. 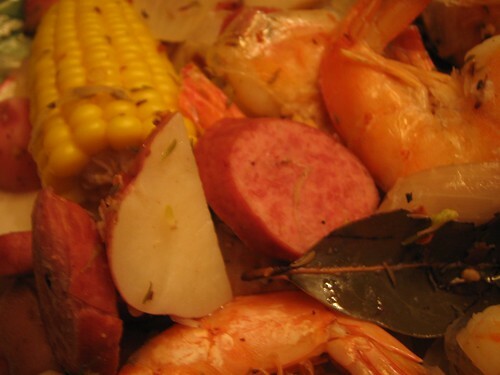 One of the biggest things that she anticipated about returning "home" during school breaks was a big meal of what she called "Frogmore Stew." She described it in poetic language; as nothing less than the world's most perfect food. Alas - in college, I was not so very interested in food. So I filed her comments away in a dusty part of my brain, and didn't really give it much thought. Besides, with a name like that, it didn't really sound particularly appetizing to me. 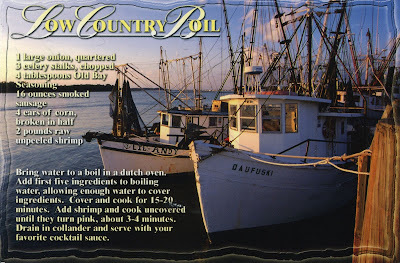 But Bekka's postcard got me wondering - this "Low Country* Boil" sounded a lot like Loretta's Frogmore Stew??? If you enjoy cooking (or simply reading beautifully written cookbooks), if you are interested in the South and/or its cuisine, or if you just enjoy a good story (because its pages are peppered with them) then this book needs to be on your "Must Read" list. But I'm wandering off-topic... Shocking! The brothers Lee did not let me down - they explained that "Lowcountry Boil" is another name for Frogmore Stew. And no matter what you call it, it is the ultimate one-pot meal. 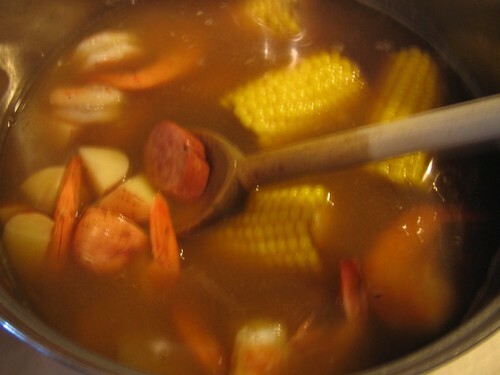 Ingredients vary due to personal preference, and what you have on hand - but almost always include: shell-on shrimp, sausage, crab, corn, potatoes - all of which simmer in a heavily seasoned broth. Not only did they give me a great explanation - they gave me an amazing sounding recipe. Unfortunately for me, as many of you know I've been indulging in the MoonPie habit a little too frequently these days. And, to put it simply, it's not been kind to me. So, a little research was done to see if I could find an alternate version. One that might not do too much damage. One quick trip to the store to pick up corn and shrimp, and I was in business. It's not the prettiest looking thing while it cooks, is it? In keeping with the easy-peasy theme of fixing up a whole mess of this stuff - serving it is to be a casual affair as well. Ideally, you serve it outside and just dump the drained contents of the pot directly out onto a newspaper covered tabletop. Since it's been cold here lately, and we were eating inside, I opted to drain it and then dump it out on a big communal platter. Now - the real test. I plunked the platter down on the table, strew a few bowls around for discarding the shrimp shells and corn cobs, and waited for everyone to dig in. I can tell that this is going to be in heavy rotation at the House That Crazy Built this summer. NOTE: The recipe ** was designed to serve 8. I halved the main ingredients, thinking that would cut it down for 4. However, with only 3 of us, I got two whole meals out of it - bonus! And, lazy me, I didn't even reheat it the second night, and it was still awesome served up cold. **I'll provide this link, but am not sure it will work for everyone - you may have to subscribe to the magazine??? No frogs in there, huh? Gosh, now I want boiled shrimp! I was just thinking, this is how we boil everything, especially crawfish. The potatoes and corn are so good that way. Good stuff!! Yum! My co-worker, a lovley woman who spent many a year living in Atlanta, often cooks up a gourmet lunch for the whole office in the summer. 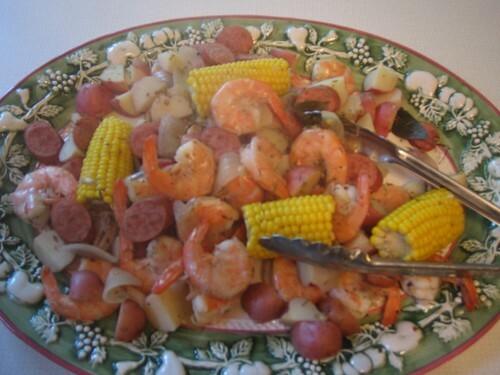 And on more than one occassion it has been frogmore stew. So good. i'm so glad i sent you that postcard then. i can't say i've ever made a recipe that appeared on a post card, but i sure like to look at them for inspiration. will have to check out the cooking light recipe and see about making that myself. trouble is that ian won't eat any kind of seafood, so i'd have to make a mess of it myself and eat it all myself. will try link for CL and i guess there, it had all the nutritional information? we're dieting. and that's so hard. makes life so impossible and i feel like i'm starving all the time, but soups and stews are usually diet friendly. and tonight? i'm really gonna dig out the lles brothers cookbook and dig into it! speaking of moon pies... after reigstering and picking up my tote bag and materials at TLA/Chattanooga last week, i looked inside my bag and what did I find? A MOON PIE! but i didn't eat it. and it was so squashed it wasn't like i was sending it on to you. i left it in the bag. just in case. like if i hadn't eaten in hours and needed a quick fix i ate a scoop of ice cream at clumpies instead.